It was exactly five years ago today that Digg went live as a simple site where you could vote on your favorite content from around the web. (Here is our initial profile from over 4 years ago.) They've grown a lot since then, to over 40 million monthly visitors and 80 employees, founder Kevin Rose writes today. But perhaps more impressive is that for their fifth birthday, Digg received quite the gift from San Francisco Mayor Gavin Newsom: An official proclamation that today is "Digg.com Day" in the city. It was exactly five years ago today that Digg went live as a simple site where you could vote on your favorite content from around the web. (Here is our initial profile from over 4 years ago.) They’ve grown a lot since then, to over 40 million monthly visitors and 80 employees, founder Kevin Rose writes today. 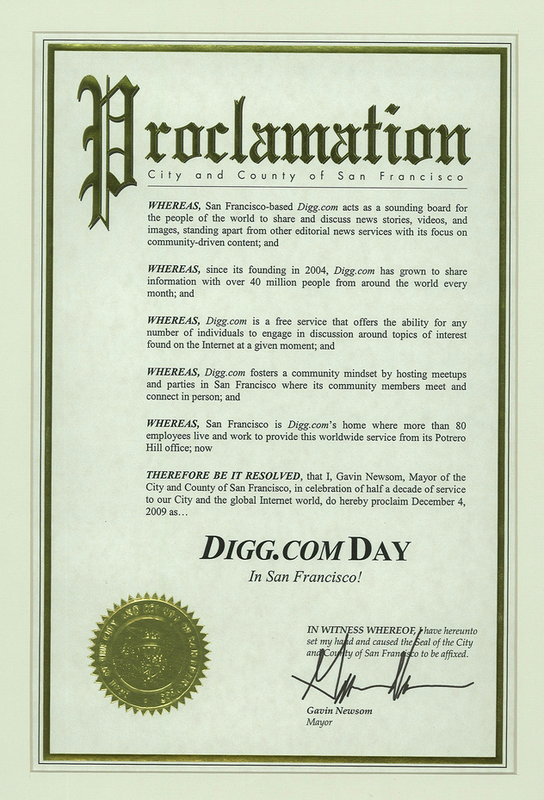 But perhaps more impressive is that for their fifth birthday, Digg received quite the gift from San Francisco Mayor Gavin Newsom: An official proclamation that today is “Digg.com Day” in the city. Now, I’m not really sure what this means, but it certainly is all official-sounding; I count 5 uses of “whereas” and one “whereof” thrown in for good measure. “We are proud and humbled by this honor,” Rose writes. To celebrate the milestone, Digg has also launched a new visualization tool called Digg 365 to surface some of the most dugg items from the past 5 years. Built by The Barbarian Group, it’s really slick. And it’s a good idea. Much of the content on Digg has a very short shelf-life due to the nature of the site, but that doesn’t make some of it any less interesting, even 5 years later. Though recently, Digg has lost much of its early hype to services like Twitter and Facebook, the company is trying to push forward into a new phase of growth. They recently stole a Google executive to be their VP of Product, and are prepping the next version of the site. And thanks in part to their new Digg Ads, they could see revenues of up to $15 million this year, we’ve heard.